Raleigh Self Storage at 2220 Capital Blvd. Located at the corner of Capital Blvd. and Crabtree Blvd. a few minutes from I-440, Extra Space Storage serves Raleigh residents near East Raleigh and Downtown. Locals will recognize our facility near The Salvation Army, Greyhound Bus Station, and Epiphany Wines. We're also accessible for residents of nearby apartments, such as Manor Six Forks, The Avenues Apartments, and Marsh Creek Apartments. Extra Space Storage is about 2.5 miles from William Peace University, 4.8 miles from North Carolina State University, and 5.1 miles from Meredith College, so we're a convenient option for college students in Raleigh who need storage units over the summer or while studying abroad. With a wide range of storage unit sizes and convenient amenities like wine storage and climate-controlled storage, Extra Space Storage on Capital Blvd. is the solution for you in Raleigh! No matter what you plan to store, our Raleigh storage facility has the space to accommodate you! We offer storage unit sizes from 2x2 to 20x20 with features like climate control, indoor access, and more! We know customers want peace of mind when storing valuable items. To ensure a secure environment for customers and their belongings, our Capital Blvd. storage facility utilizes 24-hour video surveillance. Store sensitive belongings safely with climate control! These units are kept between 55 and 80° year-round to prevent damage to your items caused by extreme heat and cold. Climate-controlled units are available in sizes 2x2 to 20x20. Looking for temperature-controlled wine storage? Extra Space Storage offers special storage units with climate control for storing wine and spirits. Wine storage units come in sizes 2x2 to 5x6. At Extra Space Storage, we believe our customers deserve the best. We make it a top priority to provide excellent service for each and every customer. Our friendly, professional staff maintains a secure, clean facility at all times, and they're more than happy to help with whatever you need. Contact us today to reserve a storage unit in Raleigh! Great facility and employees. We needed a locker right away and the facility management was very helpful and professional. I would refer to extra space storage to anyone looking for office space or a storage facility. The staff are on point as well as upper management. The GM visited our site and he was extremely pleasant and helped us with our growth. I am so glad I found Extra Space Storage. Everything about the facility and the customer service is ideal. This is a great place! The people are kind, courteous, helpful and informative. It is very clean, bug free and the price is comparable to others in the area. There are bays to pull a moving truck in to which makes it much easier to unload. Great location, clean space with easy access! Staff was extremely friendly & helpful! Would recommend to anyone looking for a clean storage spot! Great location and great facility! Russell and Ray are wonderful and so helpful! They keep the facility clean and always have a smile when they see you. No need to look at other facilities - they have everything you need right here. Love this company and location. They were competitively priced and pleasant to work with. The leasing process was thorough and efficient. The staff was extremely helpful. I would highly recommend this storage facility. 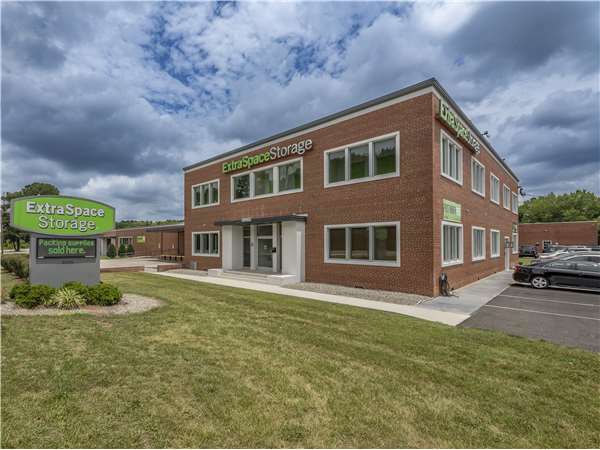 ExtraSpace storage is conveniently located, offers competitive prices for climate controlled storage. Staff at the locate is friendly and Russell took the time to walk me through the process and provided relevant information. Overall a great experience. Staff are excellent and were very accommodating to my last minute needs. I would highly recommend to anyone who is looking for a place that is secure, well maintained and have friendly staff. These guys are awesome, If you are looking for the best place this is the place to store it. Fast and friendly service in every way. Excellent setting, security, service, store manager and location! Amazing great loved everything. Russell was amazing with everything. Loved how close it is to my school amazing great experience love gold stars to everyone. Decent option. Best place I’ve stored. Very clean facility that was easy to access. The level of security for our belongings and the ease of secured access made us feel comfortable using Extra Space Storage. This is an excellent place to store your property and it will easily exceed your expectations. The staff is very professional, efficient, knowledgeable and friendly. The facilities are clean, secure, climate controlled and easily accessible. Best place for all storage needs. A smooth and easy process. Staff very professional. Great prices, great location, & a wonderful staff. Really clean and lots of options no matter what you may need. Opens early & closes late. What else could you need?!?! Great storage facility. Super clean and everyone was very helpful and accommodating to our needs! It's the best storage faculty I ever came in contact with and I will definitely recommend this business to family friends & others ! I can't say enough about this place ! The staff at Extra Storage makes the storage process simple by making sure that you know all that is required and your concerns are addressed. The facility is open, clean,and secure. You will feel comfortable. Highly recommended! Lucia got me set up quickly and professionally, with a storage unit that suits my needs perfectly. The facility is clean, bright, and well-staffed. I'm very happy with Extra Space. Folks who are there to make you fell welcome and well taken care of. The facility is clean and well kept. A pleasure to do business with them. Customer service can't be beat. The cost is very reasonable. The building is very clean, we'll maintained and comfortable to work in. The loading docks are the best feature. The facilities in Raleigh a were clean and well kept, and the staff was amazing and helpful! I would highly recommend this business! This is a great facility for my entire Wine Collection...great security and back-up power at this facility make it the perfect environment for all my treasured fine wines...no matter what the weather; It is always perfect inside my wine locker...Two thumbs up!! I am a college student so i always have to worry about finding a storage place that i can trust my belonging at but also one that I know is clean and safe. I found Extra Space Storage online and have had a wonderful experience with them. The staff is super friendly and ready to help you with any questions. The prices for the units are really good too, plus a free month doesn't hurt. Overall I am pleased with my experience and would recommend the place. My check-in coordinator (Bill?) was one of the most friendly people I've ever worked with — he was super efficient, explained everything clearly, and was exceptionally friendly and honest with me. I would recommend this place to anyone! My only complaint is the 10pm cutoff time — it would be more convenient if it were around 12pm. Staff is super. Bill was wonderful, very helpful and professional. This is a great and convenient location for a storage facility. It is clean and secure. The Bill and Madison are very knowledgeable, helpful, and just pleasing to deal with. I feel no stress about my property being stored here because of the adequate security. I give this facility six stars out of five. My friend referred me to Extra Space Storage because she and her husband are using them in VA for their move back to NC. She loved them so I figured I would give them a try. Not only did I receive my 1st month free, I got a 17' moving truck for FREE; and my friend received $50 off a month for referring me. The process was super easy and Madison was super friendly and accommodating. If you have an Extra Space Storage facility in your area, I would recommend going with them. The units are also climate controlled. As this building was previously owned by my father, we had an abundance of items that needed to be stored. Everybody here has gone above and beyond to accomodate our needs and have made this a very pleasant experience. I have recommended this facility numerous times. I found this Extra Space Storage to be exactly what I need for my storage requirements. Inside secure storage, extremely clean, well maintained, and easy access. The manager could not have been nicer or more knowledgeable. I left with the impression that she really wanted my business. I had a great experience with extra space storage. Very fast and helpful! Very nice, clean, safe storage facility with professional and friendly staff. LOTS of storage size options as well as humidity & temperature controlled wine storage (which is hard to find in Raleigh!). We highly recommend it. They have a loading dock which makes it easy to back up to and unload your stuff, as well as flat rolling carts to use while at the facility. Great place to rent storage! I was pleased first of all with the excellent customer service. Management was very thorough and accomodating. I enjoyed the attitude of the workers and the unit is the cleanest I have ever seen. They made it very easy for me to find a unit and store my things. Follow US-401 S / Capital Blvd toward Downtown. Turn Left onto Crabtree Blvd after the train overpass across from the Salvation Army center. The rental office will be on your left across the street from Bank of America. If you reach Raleigh Blvd, you've gone too far. Take I-440 W to exit 11A, take ramp right for US-401 South toward Downtown. Turn left onto Crabtree Blvd across from the Salvation Army. The rental office will be on your left across the street from Bank of America. If you reach Raleigh Blvd, you've gone too far. Take US-64 W / US-264 W to exit 419. Take ramp right for I-440 West toward Wake Forest. At exit 11A, take ramp right for US-401 South toward Downtown. Turn left onto Crabtree Blvd across from the Salvation Army center. The rental office will be on your left across the street from Bank of America. If you reach Raleigh Blvd., you've gone too far. Take I-440 E / US-1 N / Cliff Benson Beltline to exit 11. Take ramp right for US-401 South toward Downtown. Turn Left onto Crabtree Blvd after the train overpass across from the Salvation Army. The rental office will be on your left across the street from Bank of America. If you reach Hodges St, you've gone too far.